What do the symbols on the right side mean? ‘Man’ ‘Woman’ ‘Star’ ‘Plus’ ‘Infinity’. Did the Illuminati publish it? Ben Casey–Wasn’t that the newspaper strip Jim Steranko worked on? New hospital regulation: no more military-grade flashlights allowed in the operating theater. Come on people, I can’t believe I have to even say this. Man, woman, Captain Marvel plus Infinity Wars can only mean we will be seeing Carol Danvers AND Mar-Vell in the next Avengers Movie! And Ben Casey will operate on that cancer and save Mar-Vell’s life! From DEATH! Who loves Thanos! And… uh… carries a flashlight! I’m old enough (barely!) 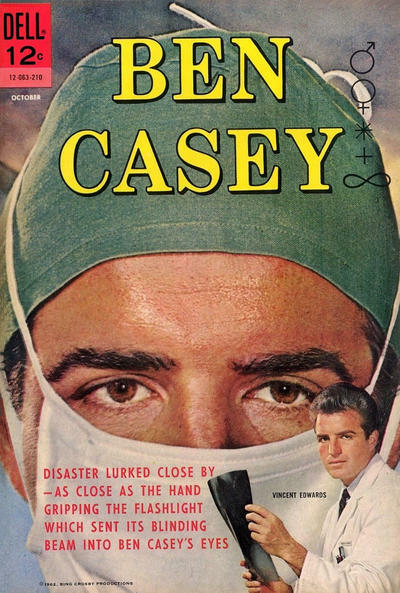 to remember watching the Ben Casey TV show. At the beginning of each show they showed the symbols as a voice intoned: Man – Woman – Birth – Death – Infinity. So that’s what they mean! Ah, that’s what I was thinking of. Thank you!